The Hasbro Children's Hospital pediatric intensive care unit (PICU) has earned a Silver Beacon Award for Excellence from the American Association of Critical Care Nurses (AACN). This three-year award recognizes Hasbro Children's Hospital for meeting or exceeding national quality standards for improved patient outcomes and for a healthy work environment. The hospital's PICU is one of only 21 in the U.S., there are 337 nationally, and one of only three in New England to hold this designation. "This Beacon Award is evidence of the hard work, professionalism and quality patient care that all of our PICU staff work so tirelessly to achieve every day," said Myra Edens, RN, MSN, administrative director of Hasbro Children's Hospital. "Achieving this designation means that our most critically ill patients and families are receiving better care, improved outcomes and greater overall satisfaction, which is invaluable in the healing process." 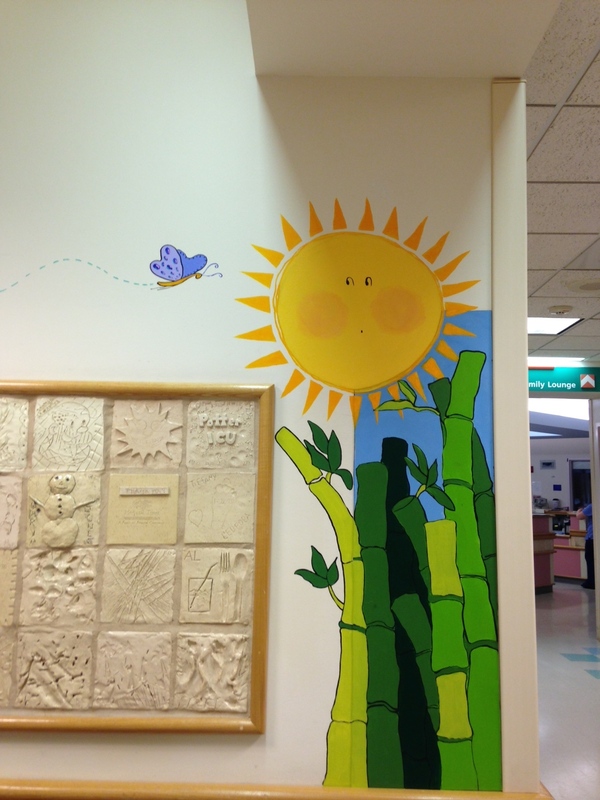 Public Art Works were selected to submit a proposal for an art installation that would transform the plain tan walls in the PICU to colorful, lively and playful images that would bring a smile to a young child's face.